Good day, gentle readers! Today I’m finally bringing you my long overdue recap of the wonderful NerdCon; Stories 2015. This post is long and a bit ramble-y, so most I’ll sum it up at the top by saying that this was one of the best conventions I’ve ever been to, all of the presenters were amazing, and driving 3000 miles can give you a pinched nerve in your shoulder. The first few days are road trip related, skip to the middle if you just want to read about NerdCon. Today’s book review bring you my thoughts on Chuck Wendig’s Aftermath. Most of you might have noticed that a fair number of my posts have started with “Flash Fiction Challenge:” and in the little blurb before each story, I include a link to the blog at terribleminds.com, the wordy-talky-type-place hosted by none other than Aftermath’s author, Chuck Wendig. This is my roundabout way of saying that I came to this story on a different lead than a fair number of folks reading it. I grew up on Star Wars. Being a bit too young for the theatrical release, I still managed to wear out a Betamax copy of Return of the Jedi. More specifically, the Tatooine portion of that film. Once they got to the live action care bears, my five year old attention span wandered, and I never quite grew out of it. I was excited as anyone when the prequels were announced, and just as disappointed with how they turned out (though I still think 2 & 3 are watchable, but that’s the subject of another blog post). I gave up three episodes in to the clone wars cartoon, and, most relevant to this, I’ve never read any of the Expanded Universe books. I picked up this book because a) it was announced as official cannon and b) written by a writer who’s works I’ve read and enjoyed. Another day, another review posted on the Blogmachine. This week we’ll be taking a look at The Lives of Tao by Wesley Chu (amazon link). I’m not sure exactly what counts as spoiler territory in this book, but I think I’ll be safe as long as I don’t reveal too much that you can’t find out by reading the back cover. Hello, good readers, bad readers, and everyone in between! 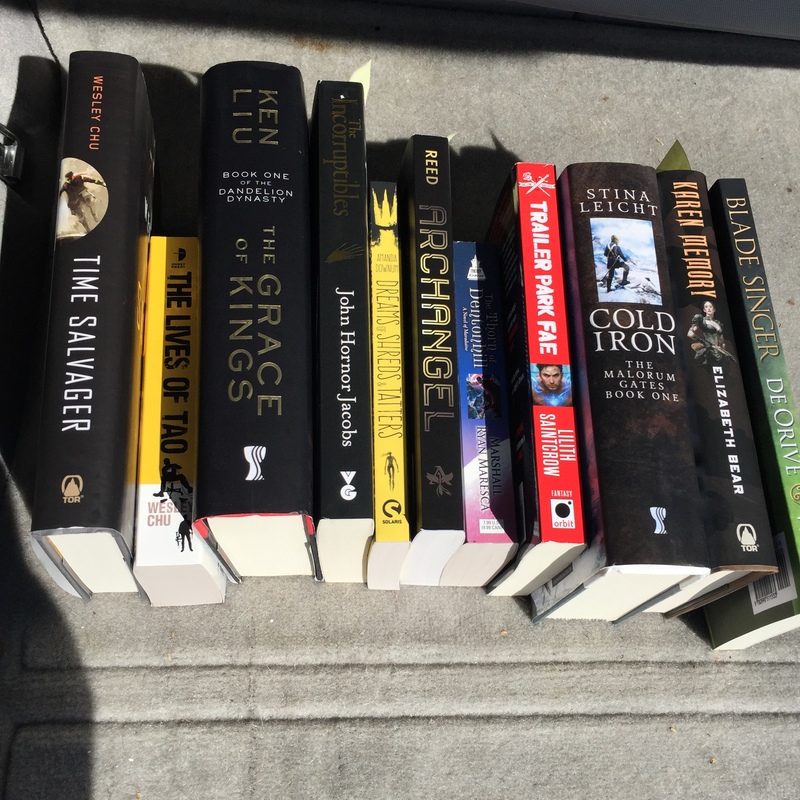 It’s time for another book review, and I’ve again gone to my Armadillocon haul and pulled out Archangel by Marguerite Reed (amazon link). As with every review, I’m going to do my best to keep it spoiler free. As part of the challenges presented in Untitled & Unfocused, I’ve committed to reading at least one book a week, and I’m going to start by going through my Armadillocon purchases. This week’s offering is The Thorn of Dentonhill by Marshall Ryan Maresca. In other news: This weekend I had a pretty amazing time at Armadillocon. 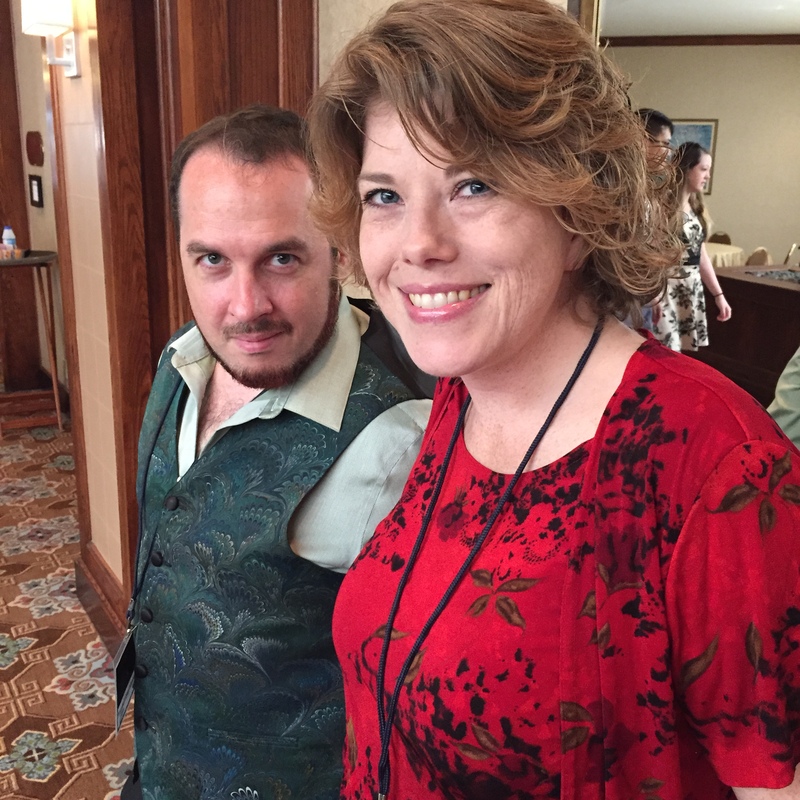 For those of you that don’t know, Armadillocon is a SFF literary convention in Austin Texas. They’ve got an excellent writer’s workshop, a wide number of panels covering the business of writing for a living and dealing with social issues, and a chance to meet with authors, editors, and publishers. There’ve been quite a few other write-ups, but here’s the highlights of my weekend. It was well worth my time, inspiring, and I’d suggest that if you’re an aspiring author and find yourself in Texas next summer, you should sign up. I scheduled myself from early morning until late into the night each day of the con. The panels covered topics from Research to Humor to Feminism to Silkpunk to Lovecraft to the Hugos and everything in between. Talk to people after panels. You’ll make new friends. Side note: If you ever get a chance to see a panel with Marguerite Reed or Justin Landon, it will be worth your time. If you get a chance to see a panel with Marguerite and Justin, it will be worth skipping out on something else that’s worth your time. Another awesome thing that happened occurred while I was hanging out at the bar, downing a ginger beer and conversing with a few of the authors about life, writing plans, and the like, when someone brought up food. I mentioned that I was fine, as I’d had a grand total of three candy bars since that morning and should be able to grab something once I got home around 11pm. Fortunately for me, they insisted that I not starve myself to see more panels and we wound up at the hotel’s restaurant. So, a big thanks Derek, Gwen, Stina, Marguerite, and Marshall for letting the new kid tag along and break bread with you. The conversations were delightful, silly, and made me feel at home. Someday I hope to be able to do the same for someone just starting out (and to hang out with you all again). You folks rule. I had a great time, learned quite a lot, and made new friends! All in all, a great experience. I seem to have caught the con bug. Next stop: Nerdcon! I lied when I said 3 candy bars. I had forgotten the words for cashews and fried apple pie. Probably still good I ate. After the third and final pass through the dealer’s room. So, so broke now. 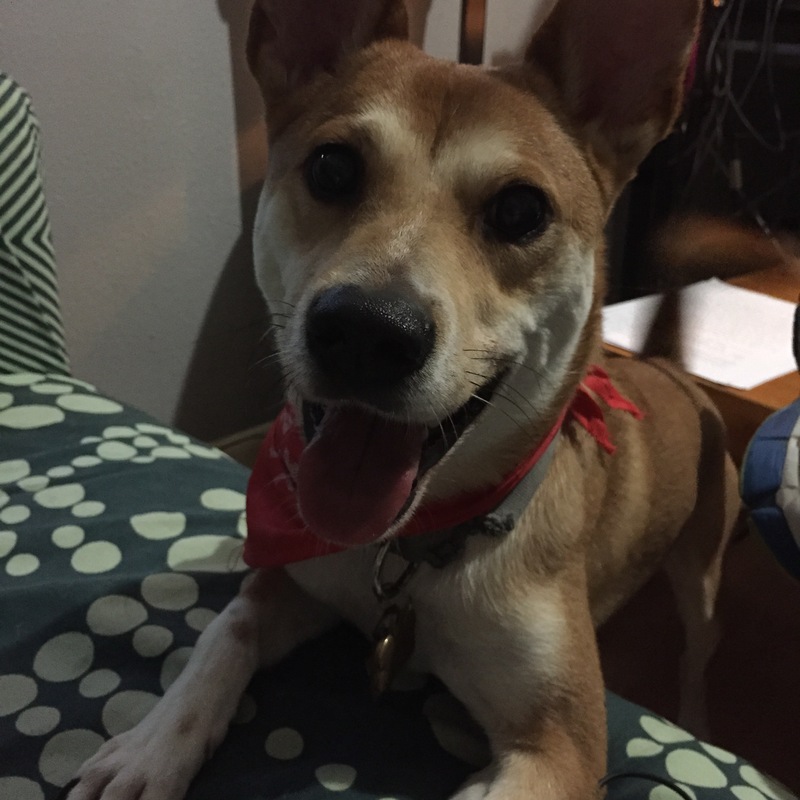 DogeFace was happy when I got back. Actually, I have no idea why this picture is here, but it’s cute, so I’m just going to run with it. Something about being hard at work on revising my story after the workshop.